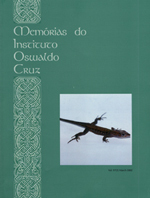 Insects of the Simuliidae family have been the object of control in Rio Grande do Sul since the 70s. Their constant attacks became a social-economical problem as well as a problem of Public Health, with serious consequences to men and to the economy of the areas in which the insects develop. At first, the control was done with a chemical larvicide Themephos ABATE 500 E, but an imperfect measuring of outflow to determine the quantity of the product made Simulium spp. resistant to it. From 1983 on, following a study of a new method for the outflow measuring, we started to use a biological larvicide Bacillus thuringiensis serovar israelensis based. The biological control uses the new method in 36.4% of the state area, assisting about 3,500,000 inhabitants.